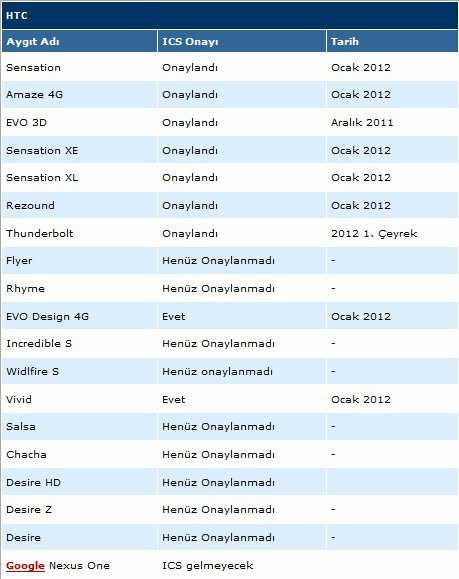 Update: It appears the table in question has been shared on the HTC Turkey wall, not by HTC itself. Whilst the information might be correct, it has not come from an official source. Taiwanese smartphone maker HTC appears to be preparing to roll out its first wave of Ice Cream Sandwich updates for its Sensation, Rezound, Evo and Vivid smartphones later in January, its Turkish office has today revealed. HTC Turkey posted an update schedule to its Facebook profile, detailing the status of each of its Android devices and the expected date for when Ice Cream Sandwich would begin to roll out. According to the table, the HTC Evo 3D release was expected in December 2011 and has not yet rolled out. Following the Evo 3D, the HTC Sensation, HTC Sensation XE, HTC Sensation XL, Amaze HTC 4G, HTC Rezound, HTC EVO 4G Design and HTC Vivid are ‘confirmed’ to receive an Ice Cream Sandwich update in January 2012. HTC will then follow up with an update for the HTC Thunderbolt in Q1 2012. HTC Turkey notes that the HTC Desire, HTC HD, HTC Desire S, HTC Desire, HTC Incredible S, HTC Flyer, HTC Rhyme, HTC Wildfire S, HTC Salsa and HTC ChaCha have not yet been approved for the update. Having remained vague on which of its handsets would receive an upgrade to Google’s latest Android 4.0 (Ice Cream Sandwich) update in October, HTC confirmed which of its devices would be eligible for the new firmware in November.